A comfortable bed, plentiful breakfast, good company, and of course: TRAINS! The Station Inn has undergone some staff changes over the last several months, and long-time guests may see some new faces. Please rest assured that we are under the same management, and that we’ll still be here when you need to make a trip to the Allegheny Mountains to enjoy some mountain railroading! The Station Inn… Railfan lodging in Cresson PA. CALL 814-886-4757 to book directly. The Station Inn’s rooms are spotless and bright. They are free of doilies and decorative pillows. BTW: Who cleans those fancy pillows you toss on the floor at bedtime? Just asking. The Station Inn is not associated with any booking service, or travel agency. It is Independent, Friendly, Small, and Unique. The Station Inn does not accept reservations from Online Travel Agencies. ….. like: TripAdvisor, Airbnb, Travelocity, Expedia, B&B.com, Hotels.com, etc. There are many OTA‘s. They do a good job, but not good enough. Too impersonal. Too costly. Too many booking mistakes. Too big. Priceline controls millions of bookings through: Booking.Com, agoda, Kayak, PriceMatch, Rocketmiles, Travelweb, and, I guess, others. Noted earlier: we are Small, Friendly and Unique. The Station Inn is a Bed and Breakfast, not a hotel. We host hundreds of guests annually. 85+% of guests are railfans who return often to enjoy our B&B hospitality. Your breakfast is complementary at The Station Inn. Book directly. Talk with a live person… get immediate feedback and honest, accurate, answers. You’re in charge when you reserve. Once booked, your reservation is guaranteed. Specific room assignments are not guaranteed and may be changed. A deposit is not necessary. Reservations must be reconfirmed a week prior to arrival. Surf our site. Take notes while watching our videos. Use this website to plan a railfan adventure that avoids wrong turns and blind alleys. Find the best train watching spots on the old PRR Pittsburgh Main. Discover out-of-the-way, public places to capture outstanding photos. Use our website to take in live train action on Mike Kisser’s RailStream Cam. Listen to NS, CSX, and RJCorman on Mike Saverino’s RailroadRadio feed. See mainline time-delay images captured from our Reading Room cam. Watch Doug Obert’s West Slope, Horseshoe Curve, and Around Our Mountain Youtubes. Plan a visit. The Station Inn IS Railfans. Stay with us. Note to trip Advisor junkies: We is what we is. Our plumbing works. We serve great breakfasts. Our rooms are fresh and pleasant. ***** Cresson is a small town and ours is a neighborhood of college students. Parties? Yes. Loud? Occasionally. *****Cresson is a regular stop for biker tour groups. We abide loud machines and their macho riders. *****And, we are near the railroad. Trains may wake you. *****The Inn is not air conditioned. ***** Most B&B’s advertise 16 or 18 as the youngest guest age. Our 8 years old child policy is unusual. Youngsters are welcome. ****However, when near the railroad children must be accompanied by an adult. Parents will be refunded unused room charges and asked to leave if their children are not supervised. ****We welcome Trip Advisor comments. Stuff beyond our control may be a legitimate part of a review. The college kids are here, the motorcycles roar by, the trains are close. The loud bikes remind me of the Harley I didn’t buy. The college kids prove that ours is not a gated community. We’re in the mountains at 2,000 ft elev. There is an abundance of clean, cool air. Lack of air conditioning is a once or twice summer discomfort. The trains? For heavens’ sake ….. that’s why we are here. We is what we is. See our RESERVATION POLICY for details concerning children, pets, alcohol, and tobacco. NIGHT TIME RAILFANNING? WHY NOT? WATCH THE TRAINS FROM FROM OUR FRONT PORCH. Horseshoe Curve… from the Air! Courtesy of youtube.com/supertrainsvideos! Another Dave Williams special, showing us the new and improved view at Horseshoe Curve! 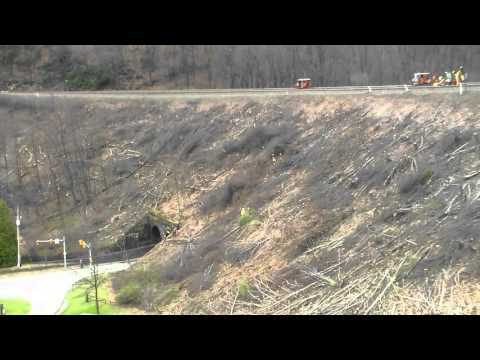 Dave Williams brings us this news – Horseshoe Curve brush cutting has taken place. A new clear view is again available! Call or email us for info or for reservations!